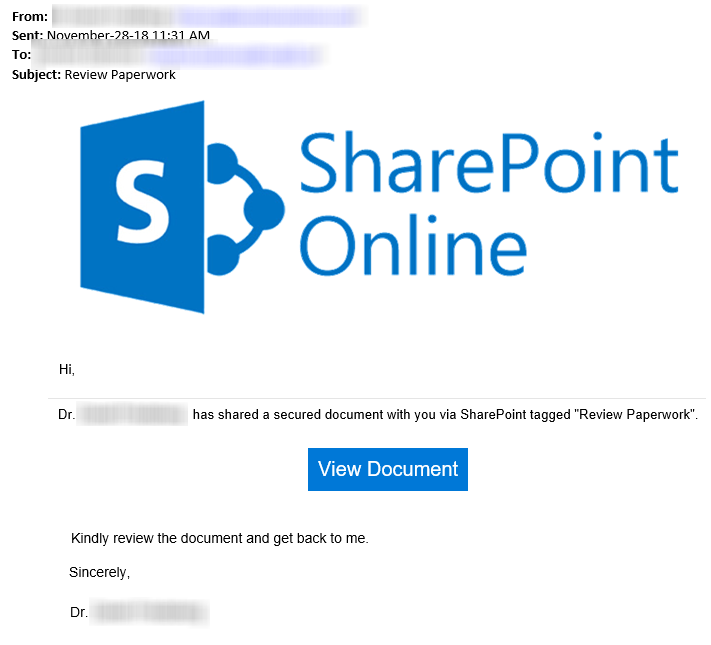 Phishing scams related to SharePoint file sharing - Subject "Review Paperwork"
Watch out for emails with a generic title, such as "Review Paperwork" and links to "View Document", "Open Document", etc. These types of emails appear to notify you of a document that is being shared with you from SharePoint or other cloud file sharing services. Don't be fooled. If you receive this type of message, DO NOT click on any of the links within. Delete this email immediately! This email is a fraudulent attempt to gain access to your personal information. If you have already clicked on the link in this email and submitted any personal information (McGill Username and Password), you should change your McGill Password as soon as possible. See the McGill Password Reset Checklist for instructions. If you have received a phishing email or suspect that you have, please send a message to phishing [at] mcgill.ca (subject: Report%20a%20phishing%20scam, body: Attach%20the%20suspicious%20email%20to%20this%20message.) with the suspicious email as an attachment. When you share documents from OneDrive or other cloud file sharing services, be sure to write a detailed message so that recipients know it is legitimate. You may also want to follow up with those recipients so that they will expect to receive a shared document from you.